We are excited to announce that the long-time publisher of the Toronto Gardener’s Journal & Source Book, Margaret Bennet-Alder, has handed the publishing reins to us. 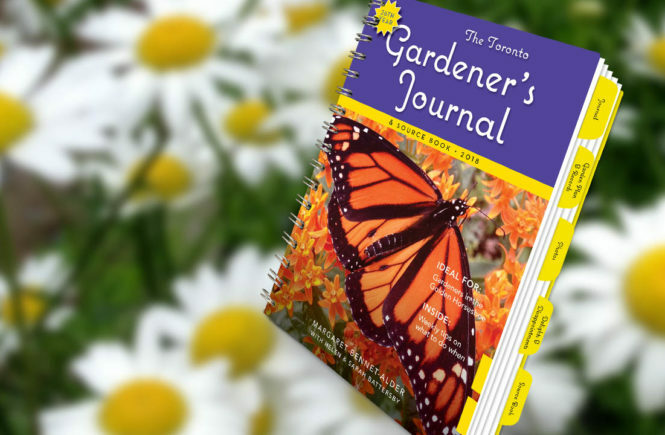 This extremely useful journal has always been a favourite with us, and it’s been on the Toronto garden scene for over 25 years. 2018 will mark birthday number 26. Not only is the garden journal a great record-keeper, the Source Book covers 60 pages (in 7.5-point type, to squeeze it all in!) of gardening resources. That’s a whole lot of excellent garden books, websites, services, organizations, seed and plant sources, and more at your fingertips. The transition didn’t begin till late September this year, so Margaret and her son David had already completed much of the work on the journal. We’ve only tweaked the insides this year. However, we did give the cover a new look (and we share a cover credit with Margaret). We have also fully redesigned the website – which launched last night. It uses responsive design, making it handy for mobile use. Margaret Bennet-Alder began her labour of love at age 65 and now, at 90, is looking forward to a well-deserved break! Thank you, Margaret, for everything you’ve contributed to Toronto-area gardeners. You’re an inspiration to late-bloomers everywhere. And thank you for thinking of Sarah and I when you were ready to pass the baton. Helen – congrats to you and your sister! You must be thrilled!! We are really excited, Tonya. At the moment, Andrew, you can only pre-order the books online via secure PayPal link at: http://torontogardenbook.com/. Once the books come back from the printer, you should be able to buy them in person at nurseries, botanical gardens, independent booksellers throughout the city. We’ll publish a list as soon as we can. Great news! Congratulations, Helen and Sarah! Thanks, Jane. It’s one of the most exciting and terrifying things we’ve done on Toronto Gardens. Congratulations to the Battersby Sisters! The Toronto Gardener’s Journal & Source Book is in good hands – and Margaret’s good work will live on. 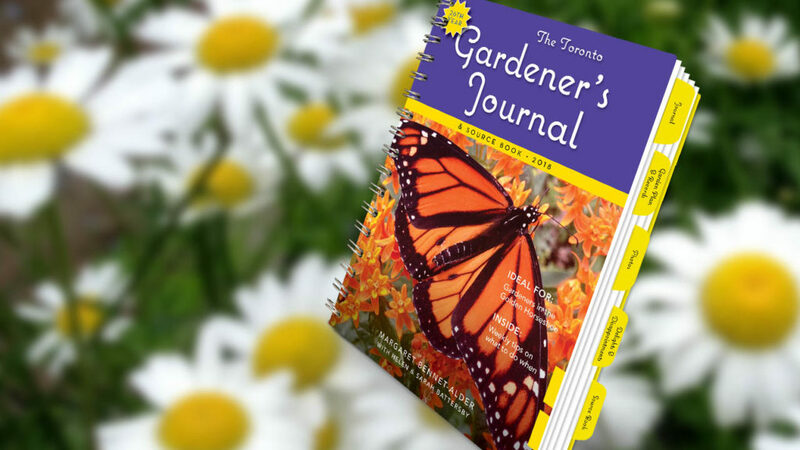 The Journal will no doubt continue to be a labor of love for you both; expanding your own knowledge and appreciation for gardening while benefitting curious and dedicated gardeners in Toronto for many, many years to come. This is very much our goal, Jennifer! Congratulations, ladies! I can’t imagine anyone better for this! Thanks, Kylee. We think it’s a good fit. Congratulations Helen and Sarah! What an honour! What a wonderful outcome to a very touching story. Congratulations to you and Sarah, and long live the Toronto Gardeners Journal. Congrats to all three of you. Margaret has done an amazing job all these years and I’m sure you will carry on her good work. Congrats Helen & Sarah. 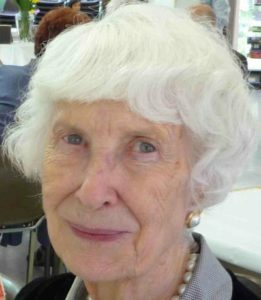 I recall meeting Margaret at the regional GWA meeting this past spring – such a lovely lady. How incredibly impressive that she was able to carry on with the Journal for so many years. Hi – When will it ship? Tamara, It’s at the printer now, and we hope to have it in our hot little hands and to Canada Post by the end of November. Canada Post has promised expedited service. Fingers crossed! I wanted to comment on your November 7th blog about squirrels and tulip bulbs, but there was no comment box. When I read your post, I immediately ordered some pelleted chicken manure. It arrived just in time! I planted several hundred tulips and, fingers crossed, the fuzzy tailed rats (aka squirrels) have not bothered any area where I planted tulips and spread the chicken stuff. We’ll see how this goes over the course of the winter when they get really hungry. I’m hopeful. Glad I am not working in the garden right now – that stuff is real stinky. Thanks for the tip. Will report back in spring. Hi, Ginny, that squirrels post was from 2016, and because of dag-blasted spammers we’ve taken off comment boxes on older posts. Thanks for finding a way to say hello, and good luck with your bulbs. Mine are still undisturbed beneath the hen poo this year – and I planted over 400 bulbs! In fall, I think I’m mad, but come spring I’m sure I’ll feel elated. Hope you will, too. Please swing by and let us know. Snowdrop alert 2017. On the early side.